How Are You Celebrating National Aviation Day? In 1939, President Franklin Roosevelt proclaimed this day, August 19, to be National Aviation Day to celebrate the history and development of aviation. This date coincides with the birthday of Orville Wright who, together with his brother Wilbur, made significant contributions to powered flight. Today, like every other day of the year, Duncan Aviation celebrates aviation as the largest, family owned business aircraft maintenance, repair and overhaul (MRO) company in the world, with over 2,000 employees. We celebrate with gratitude, as the perseverance of the Wright brothers has made a huge impact on the lives of everyone within business aviation. For the next two days, Duncan Aviation will celebrate its Founder’s Day, commemorating Donald Duncan’s birthday. Donald is the company’s founder and the grandfather to Duncan Aviation’s Chairman, Todd Duncan. This is a day for Duncan Aviation team members to pause and reflect on Duncan Aviation’s rich history while looking forward to a promising future. 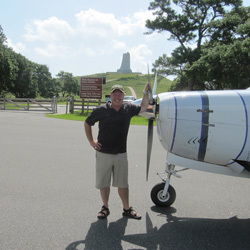 Duncan Aviation’s Chairman, Todd Duncan, visits the Wright Brothers National Memorial in Kill Devil Hills, North Carolina, while on a family vacation. That history is based upon a set of ideals passed down from Donald through Robert Duncan, Duncan Aviation’s Chairman Emeritus, and now to Todd Duncan. These values are dedicated to keeping a family culture as the company grew, no matter how many employees or locations. From the beginning, Duncan Aviation’s Core Values were not something that had to be memorized or learned by employees because they were simply a description of who they were and how they did business every day. Duncan Aviation team members embody excellence and a passion for aviation that shows in their work every day. Duncan Aviation was established in 1956 in Clarinda, Iowa, during the prosperous years after WWI and earliest years of business aviation. You could say they have been in the business from the beginning and played a major part in its early development. Over the next six decades, Duncan Aviation grew from a single location in Omaha, Nebraska, to an international business aviation pioneer with locations all across the United States and team members around the globe. Aviation is obviously very important to us. We live it every day. For many team members, who hold personal and commercial pilots license and still go flying on evenings and weekends after they have spent their entire day or week working on someone else’s aircraft, it is a passion. They say it’s in the blood. Watch Duncan Aviation’s Core Values video, as team members express why the company’s Core Values resonate so much with their teams and how they can be seen in every aspect of their workday. Every day is the National Day of something. And because there are so many things wanting their day in the spotlight, some have to share. So while we reminisce about aviation history, how it’s changed and where it’s headed, go out and grab your favorite soft-serve because it’s National Soft Ice Cream Day too!